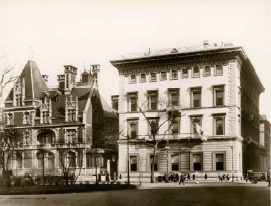 On the evening of February 20, 1891, a group of distinguished gentlemen, prominent in the civic, commercial, financial, and social life of the City gathered together for an important purpose at the invitation of William Watts Sherman at the Knickerbocker Club - then at 319 Fifth Avenue, the northeast corner of 32ndStreet. At this dinner were present Messrs. Samuel D. Babcock, George S. Bowdoin, Robert Goelet, George G. Haven, H. A. C. Tylor, William K. Vanderbilt, and William C. Whitney. The land on which the Clubhouse stands - 100 feet fronting on Fifth Avenue and 200 feet on 60thStreet - was acquired from the Duchess of Marlborough who signed the purchase agreement in the United States Consulate in London. Mr. Cornelius Vanderbilt, who represented the Governors, signed for the Club.